The first time I was introduced to a "gitzit" was in 1978 Thousand Islands tournament. Like the fish I was enticing, I was hooked by this new technique. That first day I was paired with Greg Ward, grandson of legendary TV Celebrity, Virgil Ward. He proceeded to show me what this "gitzit" was and what it could do to unsuspecting Lake Ontario smallmouth bass. 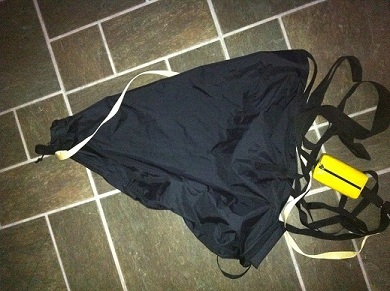 I could not believe how they smashed that funny-looking thing he was throwing – a small soft plastic tube. Greg gave me a handful and, upon my return to Lake Erie, I began to clobber smallies one after another. I can brag that I was the first fisherman to ever catch smallmouth bass on Lake Erie with what now is affectionately known as a "tube." 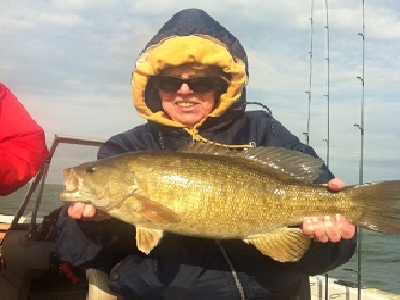 Back when I first used tubes on Lake Erie for smallmouth bass, I would simply lift and drop the bait for best results. This was easy with the short rod as the usual depth I caught them at was about 20 feet maximum. I would make a long cast and work the bait back to the boat jigging it all the way. As time went on and water clarity changed due to the zebra mussel invasion, smallmouth bass began to go deeper and deeper. In order to reach them, I was forced to start using longer rods and heavier jig heads inside of the tubes. 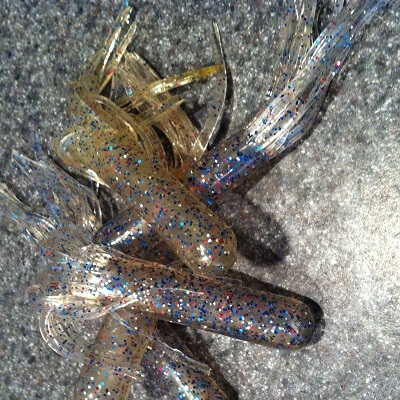 Bait color also evolved due to the increased water clarity issues that Lake Erie began to display. One of the favorite colors was chartreuse and it proved very effective when the water was stained. One recollection was of Joe Thomas of Ohio winning the 1990 Red Man All American Championship in the waters near my house on Lake Erie with a chartreuse grub. In a matter of just four years, a chartreuse colored bait could scare smallies away. The bright colors I used in the late 70's and all through the 80's began to change as the effects of the zebra mussel increased water clarity. I began to use clear silver and "firecracker" (red, silver and blue) tubes in the spring and darker brown and green tubes in the summer. My attempt to match Lake Erie's smallmouth diet of minnows in the spring and crayfish in the summer worked very well in those days. I also began to utilize a technique now referred to as "drift and drag," where you simply toss out your tube and let it drag and bounce off the bottom. It was a very successful way to catch smallmouth.Another tool that really took hold in the late 80's was the use a drift sock. I recall a tournament out of Buffalo when a good friend who had never fished Lake Erie smallmouth bass beat me on my “home court” as we fished the same school of smallies. He was using a drift sock and I had never seen one before. He came in first and I came in fifth, all because he was able to slow his boat down and allow his bait to get down to where the smallmouth bass were feeding. I should mention that there were three foot waves that day and the slowest I could get my boat to go was about two miles per hour – he was going half that speed! By the early 90's, the water color of Lake Erie began to clear constantly. This resulted in a few changes to the bass fishing. Bass began to go deeper and they started to really put on weight. We had caught nice fish up to that point but now several bass in the five to six pound range were being taken regularly. By 1995, huge bass were being caught consistently. I saw a seven and a half pound fish taken next to me one day. A few days later a fish weighing nearly eight pounds was caught. 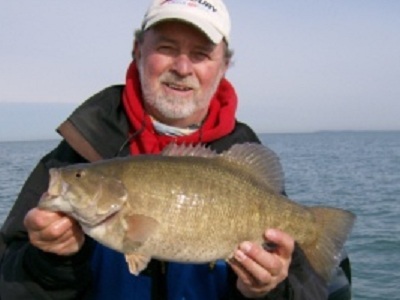 In what seemed like hours later, the current record – an 8.4 pound smallmouth was taken by a perch fisherman. That same year a five fish limit from the Hamburg area was taken that weighed 30.8 pounds.....amazing! As a result of these changes, heavier weights came into use. We began to vertical jig our tubes over deep drops and break lines, producing many excellent catches. The final change that occurred to the lake was the goby invasion. These creepy little frog-looking fish have taken over many aspects of Lake Erie, not only here near Buffalo but all over the Great lakes. 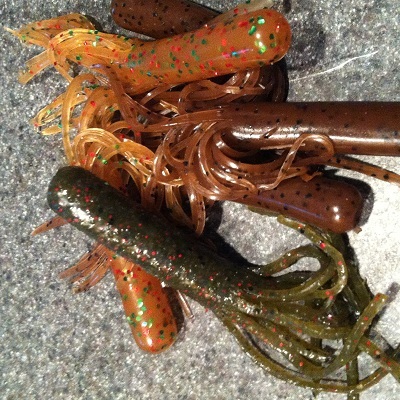 Tube colors and sizes changed how we caught our smallmouth bass. Dark browns to dark greens are the color selection of choice and for good reason. The New York Department of Environmental Conservation reported that in many cases, gobies make up 100 percent of its diet. Standard rod length is now seven feet in medium action and a good brand of braided line with a fluorocarbon leader are recommended. Fishing depths of 60-plus feet are not unheard of with 30 to 40 feet being the best depth for good daily catches.